I was dabbling with the thought to design shawls and in the future maybe garments and socks with my own hand-dyed yarn. I love to see how colors come to life on skeins of bare yarn and transforming them into something stunning and wearable. My mind was full of inspiration and ideas but how do you get that on “paper”. My little Etsy shop is full of wonderfully colored yarns that are just begging to be used, but how to make that happen. 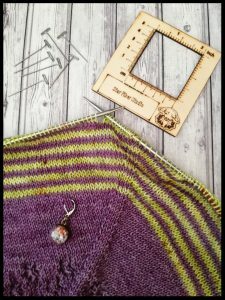 So last month I was looking on Instagram (as you do) and I found a challenge from Aroha knits that is called the initiate knit design challenge. I had seen it before and not realizing that it would be something for me, but now the bells started ringing and decided to take a leap of faith and participate. With my newly purchased book in hand, I decided on the lace sections and the colors. It was time to make a swatch and do some calculations, what I had never done before. So here we go… this is my first real design that is called Blütenblätter. Blütenblätter is German for petals or flower petals, the name is tied in with the lace of the shawl. Blütenblätter was inspired by the fresh beauty of the blossoming trees surrounding our neighborhood in the spring. The elongated triangle shape of this shawl ﬂares out the wings, making it a more wearable shawl than it’s regular triangular cousin. This shawl is similar in construction to a triangular shawl, except an extra set of increases are worked along the top edge of the shawl on the RS rows. Featuring stockinette stitch, lace, and a ribbed border. 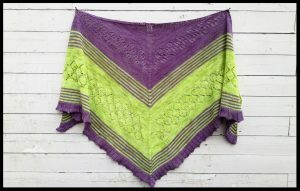 Perfect to knit while watching your favorite pod-cast or series and with details to keep this knit interesting, and that is also well within reach of an adventurous new shawl knitter. This pattern is now in the works to get test knitted by a few very generous and lovely woman, and I’m looking forward to getting the feedback so I can really publish the pattern on Ravelry. Find more out on the Ravely group and you can also follow me on Instagram.